“Habbibi! Habbibi! Habbibi!” She calls as she runs up and kisses me on both cheeks. “Ms. Sara, Arabic?” She asks if she can speak in Arabic. “Ah” I respond. And then I am swept into my daily Arabic practice, and myupdate on 10-year-old drama. Every day I arrive at the gate to our school to unlock the door around 2:15, and everyday there are already 2 or 3 young girls anxiously waiting for our cheek-kiss greeting and to be let through the schools massive metal gate. 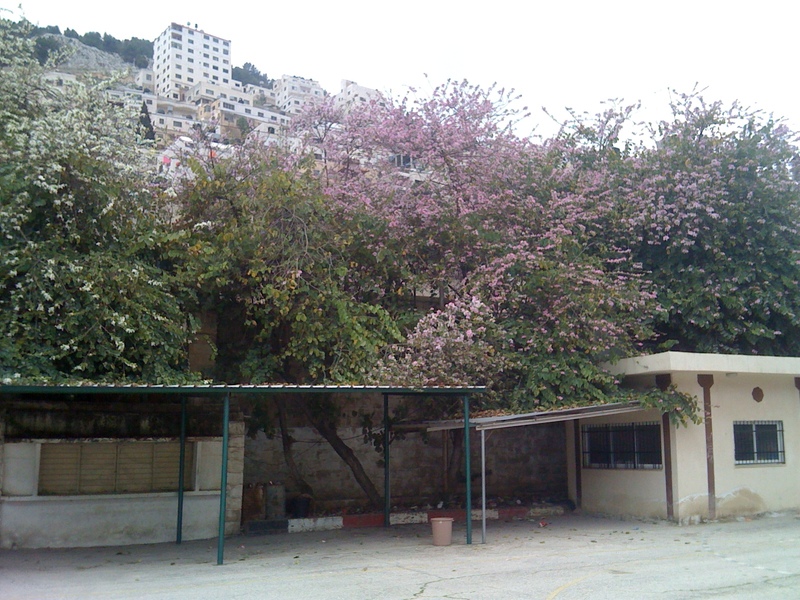 Aiashia, the school we teach at (Whose name has about every vowel sound in the Arabic language making it a foreigner’s nightmare to pronounce) has a tall wall of about 30 feet surrounding it on all sides, with equally extravagant flowering trees lining the wall, which provides an excellent haven concealed from the busy streets, a secret garden if you will, where these lovely ladies can safely be themselves without the fear of an unwanted male stare or judging elder. Aside from the male security guard and our bosses, no men are permitted within the school grounds. The basketball court is at the center of a courtyard. The actual building is a horseshoe shape with about 2 dozen classrooms emptying out directly into the cement courtyard. As students filter in they bounce between my classroom and Ms. Amy’s giggling about their day, listening to the music, and emptying their ever inquisitive minds of whatever questions they had stored for us through the day. The classrooms are hallow, and echo loudly. The desks sit two people, and each day, I drag them from their traditional rows to a dining room table esque form, only to drag them back to their original place at the end of the day. The drawings on the desk testify to what my students nag about every day. “School is boring.” I laugh. Some things are the same even on the other side of an ocean in the middle of an occupation. a of how our classes are run I will give you a few examples of my favorite activities we have done. 1. The restaurant- Amy and I quickly learned that food and learning should go hand in hand. My class received a nicely written invitation to the Princess Restaurant, and the next day the two classes gathered to find a classroom that had been magically turned into a restaurant with common desks transformed into the most classy tables with the addition of vases of wild flowers, and only the freshest and most classy food in town (Strawberries, humus, and cookies!). The girls were the waitresses, the hostesses, and of course the hungry patrons! 2. Songs!- We are encouraged to use songs as a way of increasing our girls speaking speed, so this semester my girls started off with “I am Woman” then went to “Hold On” by B*Witched and are finishing off with “Firework” by Katy Perry. I tried to stick with motivating songs. I was so proud yesterday when I gave each person in the class a solo, and each girl had the confidence to sing by themselves. I think it attests to the safe zone that Amy and I have worked so hard to create at the school. The girls at Aiashia have really become a family, and to me, that’s more valuable than any strides they have made in mastering the English language. 3. Sports- After each class we run about 30 minutes of sports. This has typically taken the form of basketball since some brilliant architect placed the basketball hoops directly in front of the soccer goals. Some days we have played hide and seek, in which, the full circle around the large building turns each round into a high-speed chase of who can sprint in a circle faster than the person who is it. A few days I have taught the girls some Taekwondo and self-defense which went over really well. 4. Plays- Amy and I both enjoyed doing dialogs with our girls. Mine did two Dr. Seuss scripts, the Lorax and Yertle the Turtle, though Amy takes the cake on this endeavor. Her girls did the Three Billy Goats Gruff. This included desks being made into a bridge that the goats could walk across and the troll could hide under, teaching ten-year olds to charge with their fingers in the shape of goat horns, and of course a lot of “Trippity, trap, trippity, trap!” I proudly made my guest appearance as the Big Billy Goat, but was out acted by the well mastered Troll voice of little Tala. The program has no specific curriculum which has allowed me to mold my class as I see fit. This has eased my concerns a bit about being a language imperialist simply spreading my language to these kids who meanwhile have bigger problems, thanks in large part to financial contributions to their occupying force from my government. As you can see, I still think about it a lot, but I am proud to say that I believe my classroom has become a place of joint learning and mutual growth between all the students and myself as well. I have 3 more days of teaching and then I think I am done teaching ESL forever, but I hope to stay in touch with these lovely ladies who will never know the extent to which they have helped me. 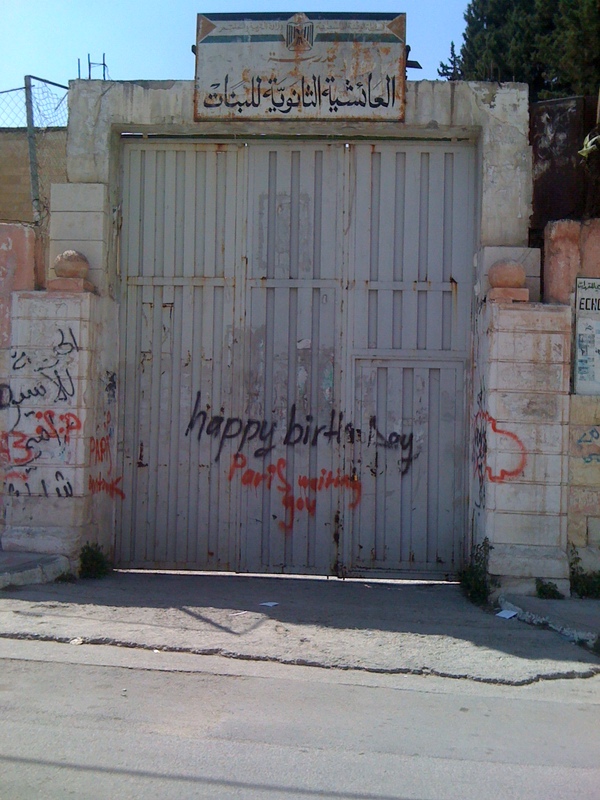 This entry was posted in A Penny for My Thoughts..., Both Sides of the River, Nablus, Palestine, Uncategorized and tagged esl, Israel, nablus, palestine, teach for palestine, teaching, west bank. Bookmark the permalink.